The gray (symbol: Gy) is a derived unit of ionizing radiation dose in the International System of Units (SI). It is defined as the absorption of one joule of radiation energy per kilogram of matter. It is used as a unit of the radiation quantity absorbed dose which measures the energy deposited by ionizing radiation in a unit mass of matter being irradiated, and is used for measuring the delivered dose of ionising radiation in applications such as radiotherapy, food irradiation and radiation sterilization. As a measure of low levels of absorbed dose, it also forms the basis for the calculation of the radiation protection unit the sievert, which is a measure of the health effect of low levels of ionizing radiation on the human body. The gray is also used in radiation metrology as a unit of the radiation quantity kerma; defined as the sum of the initial kinetic energies of all the charged particles liberated by uncharged ionizing radiation [a] in a sample of matter per unit mass. The gray is an important unit in ionising radiation measurement and was named after British physicist Louis Harold Gray, a pioneer in the measurement of X-ray and radium radiation and their effects on living tissue. The gray was adopted as part of the International System of Units in 1975. The corresponding cgs unit to the gray is the rad (equivalent to 0.01 Gy), which remains common largely in the United States, though "strongly discouraged" in the style guide for U.S. National Institute of Standards and Technology authors. The measurement of absorbed dose in tissue is of fundamental importance in radiobiology and radiation therapy as it is the measure of the amount of energy the incident radiation deposits in the target tissue. The measurement of absorbed dose is a complex problem due to scattering and absoption, and many specialist dosimeters are available for these measurements, and can cover applications in 1-D, 2-D and 3-D. In radiation therapy, the amount of radiation applied varies depending on the type and stage of cancer being treated. For curative cases, the typical dose for a solid epithelial tumor ranges from 60 to 80 Gy, while lymphomas are treated with 20 to 40 Gy. Preventive (adjuvant) doses are typically around 45–60 Gy in 1.8–2 Gy fractions (for breast, head, and neck cancers). The average radiation dose from an abdominal X-ray is 0.7 milli-Grays (0.0007 Gy), that from an abdominal CT scan is 8 mGy, that from a pelvic CT scan is 6 mGy, and that from a selective CT scan of the abdomen and the pelvis is 14 mGy. The absorbed dose also plays an important role in radiation protection, as it is the starting point for calculating the stochastic health risk of low levels of radiation, which is defined as the probability of cancer induction and genetic damage. The gray measures the total absorbed energy of radiation, but the probability of stochastic damage also depends on the type and energy of the radiation and the types of tissues involved. This probability is related to the equivalent dose in sieverts (Sv), which has the same dimensions as the gray. It is related to the gray by weighting factors described in the articles on equivalent dose and effective dose. The International Committee for Weights and Measures states: "In order to avoid any risk of confusion between the absorbed dose D and the dose equivalent H, the special names for the respective units should be used, that is, the name gray should be used instead of joules per kilogram for the unit of absorbed dose D and the name sievert instead of joules per kilogram for the unit of dose equivalent H."
The accompanying diagrams show how absorbed dose (in grays) is first obtained by computational techniques, and from this value the equivalent doses are derived. For X-rays and gamma rays the gray is numerically the same value when expressed in sieverts, but for alpha particles one gray is equivalent to 20 sieverts, and a radiation weighting factor is applied accordingly. Radiation poisoning - The gray is conventionally used to express the severity of what are known as "tissue effects" from doses received in acute exposure to high levels of ionizing radiation. These are effects which are certain to happen, as opposed to the uncertain effects of low levels of radiation which have a probability of causing damage. A whole-body acute exposure to 5 grays or more of high-energy radiation usually leads to death within 14 days. This dose represents 375 joules for a 75 kg adult. The gray is used to measure absorbed dose rates in non-tissue materials for processes such as radiation hardening, food irradiation and electron irradiation. Measuring and controlling the value of absorbed dose is vital to ensuring correct operation of these processes. Kerma ("kinetic energy released per unit mass") is used in radiation metrology as a measure of the liberated energy of ionisation due to irradiation, and is expressed in grays. Importantly, kerma dose is different from absorbed dose, depending on the radiation energies involved, partially because ionization energy is not accounted for. Whilst roughly equal at low energies, kerma is much higher than absorbed dose at higher energies, because some energy escapes from the absorbing volume in the form of bremsstrahlung (X-rays) or fast-moving electrons. Kerma, when applied to air, is equivalent to the legacy roentgen unit of radiation exposure, but there is a difference in the definition of these two units. The gray is defined independently of any target material, however, the roengten was defined specifically by the ionisation effect in dry air, which did not necessarily represent the effect on other media. Using early Crookes tube X-Ray apparatus in 1896. One man is viewing his hand with a fluoroscope to optimise tube emissions, the other has his head close to the tube. No precautions are being taken. Monument to the X-ray and Radium Martyrs of All Nations erected 1936 at St. Georg hospital in Hamburg, commemorating 359 early radiology workers. Wilhelm Röntgen first discovered X-rays on November 8, 1895, and their use spread very quickly for medical diagnostics, particularly broken bones and embedded foreign objects where they were a revolutionary improvement over previous techniques. One of the earliest techniques of measuring the intensity of X-rays was to measure their ionising effect in air by means of an air-filled ion chamber. At the first ICRU meeting it was proposed that one unit of X-ray dose should be defined as the quantity of X-rays that would produce one esu of charge in one cubic centimetre of dry air at 0 °C and 1 standard atmosphere of pressure. This unit of radiation exposure was named the roentgen in honour of Wilhelm Röntgen, who had died five years previously. At the 1937 meeting of the ICRU, this definition was extended to apply to gamma radiation. This approach, although a great step forward in standardisation, had the disadvantage of not being a direct measure of the absorption of radiation, and thereby the ionisation effect, in various types of matter including human tissue, and was a measurement only of the effect of the X-rays in a specific circumstance; the ionisation effect in dry air. In 1940, Louis Harold Gray, who had been studying the effect of neutron damage on human tissue, together with William Valentine Mayneord and the radiobiologist John Read, published a paper in which a new unit of measure, dubbed the "gram roentgen" (symbol: gr) was proposed, and defined as "that amount of neutron radiation which produces an increment in energy in unit volume of tissue equal to the increment of energy produced in unit volume of water by one roentgen of radiation". This unit was found to be equivalent to 88 ergs in air, and made the absorbed dose, as it subsequently became known, dependent on the interaction of the radiation with the irradiated material, not just an expression of radiation exposure or intensity, which the roentgen represented. In 1953 the ICRU recommended the rad, equal to 100 erg/g, as the new unit of measure of absorbed radiation. The rad was expressed in coherent cgs units. In the late 1950s, the CGPM invited the ICRU to join other scientific bodies to work on the development of the International System of Units, or SI. The CCU decided to define the SI unit of absorbed radiation as energy deposited per unit mass which is how the rad had been defined, but in MKS units it would be J/kg. This was confirmed in 1975 by the 15th CGPM, and the unit was named the "gray" in honour of Louis Harold Gray, who had died in 1965. The gray was equal to 100 rad, the cgs unit. The adoption of the gray by the 15th General Conference on Weights and Measures as the unit of measure of the absorption of ionizing radiation, specific energy absorption, and of kerma in 1975 was the culmination of over half a century of work, both in the understanding of the nature of ionizing radiation and in the creation of coherent radiation quantities and units. Graphic showing relationships between radioactivity and detected ionizing radiation at a point. 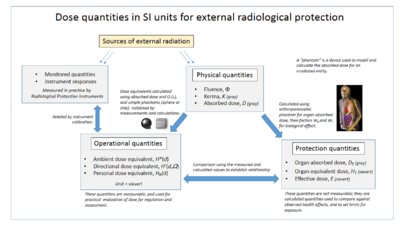 The following table shows radiation quantities in SI and non-SI units. ^ The host country nominated the chairman of the early ICRU meetings. ^ "The International System of Units (SI)" (PDF). Bureau International des Poids et Mesures (BIPM). Retrieved 2010-01-31. ^ "Rays instead of scalpels". LH Gray Memorial Trust. 2002. Retrieved 2012-05-15. ^ "NIST Guide to SI Units – Units temporarily accepted for use with the SI". National Institute of Standards and Technology. ^ Seco J, Clasie B, Partridge M (2014). "Review on the characteristics of radiation detectors for dosimetry and imaging". Phys Med Biol. 59 (20): R303–47. Bibcode:2014PMB....59R.303S. doi:10.1088/0031-9155/59/20/R303. PMID 25229250. ^ Hill R, Healy B, Holloway L, Kuncic Z, Thwaites D, Baldock C (2014). "Advances in kilovoltage x-ray beam dosimetry". Phys Med Biol. 59 (6): R183–231. Bibcode:2014PMB....59R.183H. doi:10.1088/0031-9155/59/6/R183. PMID 24584183. ^ Baldock C, De Deene Y, Doran S, Ibbott G, Jirasek A, Lepage M, McAuley KB, Oldham M, Schreiner LJ (2010). "Polymer gel dosimetry". Phys Med Biol. 55 (5): R1–63. Bibcode:2010PMB....55R...1B. doi:10.1088/0031-9155/55/5/R01. PMC 3031873. PMID 20150687. ^ "The 2007 Recommendations of the International Commission on Radiological Protection". Ann ICRP. 37 (2–4). paragraph 64. 2007. doi:10.1016/j.icrp.2007.10.003. PMID 18082557. ICRP publication 103. Archived from the original on 2012-11-16. ^ "CIPM, 2002: Recommendation 2". BIPM. ^ Siegbahn, Manne; et al. (October 1929). "Recommendations of the International X-ray Unit Committee" (PDF). Radiology. 13 (4): 372–3. doi:10.1148/13.4.372. Retrieved 2012-05-20. ^ "About ICRU - History". International Commission on Radiation Units & Measures. Retrieved 2012-05-20. ^ a b Guill, JH; Moteff, John (June 1960). "Dosimetry in Europe and the USSR". Third Pacific Area Meeting Papers — Materials in Nuclear Applications. Symposium on Radiation Effects and Dosimetry - Third Pacific Area Meeting American Society for Testing Materials, October 1959, San Francisco, 12–16 October 1959. American Society Technical Publication. 276. ASTM International. p. 64. LCCN 60014734. Retrieved 2012-05-15. ^ Lovell, S (1979). "4: Dosimetric quantities and units". An introduction to Radiation Dosimetry. Cambridge University Press. pp. 52–64. ISBN 0 521 22436 5. Retrieved 2012-05-15. ^ Gupta, S. V. (2009-11-19). "Louis Harold Gray". Units of Measurement: Past, Present and Future : International System of Units. Springer. p. 144. ISBN 978-3-642-00737-8. Retrieved 2012-05-14. ^ "CCU: Consultative Committee for Units". International Bureau of Weights and Measures (BIPM). Retrieved 2012-05-18. Boyd, M.A. (2009). "The confusing world of radiation dosimetry" (PDF). WM2009 Conference. — An account of chronological differences between USA and ICRP dosimetry systems.